Here are the three key areas that I'll be watching in 2017. The rapid consumer adoption of cloud computing and 4K video is leading to massive increases in demand for bandwidth. That's an encouraging backdrop that should be driving huge demand for optical equipment like Infinera's (NASDAQ:INFN). Unfortunately, that hasn't been the case as of late. During its last two quarterly earnings reports, Infinera warned that demand for its products was softening. The downbeat outlook caused traders to sell off the stock hard: Shares ended 2016 down more than 51%. Can the company get back on track? Here's a look at three key areas I think investors should watch in the year ahead. While Infinera has a long history of taking market share in the optical-equipment business, its last quarterly report was troublesome. Management stated that it saw declines in demand for both its long-haul and subsea products. When combined with a slight pullback in its metro and data-center interconnect business, overall revenue fell by 20%. Unfortunately, management did not believe that these trends were going to reverse themselves in the fourth quarter. The company guided for revenue during the period to land between $165 million and $185 million. That represents a 28% drop at the midpoint. Management firmly stated that the weakness is being caused by customers delaying their orders until 2017; it offered hope that demand would pick up in the year ahead. Shareholders will need to keep their eyes on the company's top line to figure out whether that prognosis is true. 2. Are gross margins holding up? Many technology companies have a hard time maintaining their profit margins over time. That's because the industry moves so fast that competitors can usually catch up quite quickly, which causes companies to cut prices in order to grow or maintain market share. While price cuts sometimes produce great short-term results and maintain top-line growth, they can spell doom to a company's profits by causing margins to contract over the long term. 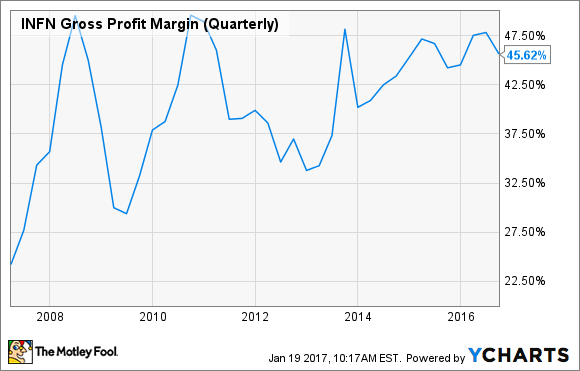 INFN Gross Profit Margin (Quarterly) data by YCharts. The company actually continued this positive trend in its third-quarter report. Infinera reported a non-GAAP (generally accepted accounting principles) gross margin of 49.2%, which was up 170 basis points over the same quarter in 2015. That's an impressive performance given the large revenue decline. Unfortunately, management does not believe that it will be able to pull off this same trick in the fourth quarter. The declining sales volume is expected to cause non-GAAP gross margin to plunge to between 40% and 42%. Investors will need to listen in on the company's conference call to learn whether this is a simply a one-time blip or it represents a new normal. 3. How are competitors faring? [W]e saw in Q4 our best-ever quarter for revenue, our best-ever quarter for orders, which were significantly higher than revenue and enabled us to exit the year with the highest backlog we've ever had. And overall it was an excellent finish to a year that positions us extremely well for 2017. That's quite a bullish statement to be coming from a major rival. While Infinera has a history of nibbling away market share, investors should also keep an eye trained on competitors like Ciena to see if the company's competitive edge could be slipping. All in all, Infinera has a lot to prove in 2017.